My neighbor called me frantic, “My son is sick, and he’s coughing really bad! Do you have something for him?” I was happy to answer that yes! I could whip up some homemade and effective cough syrup and have it over right away. Here’s this two-ingredient recipe for cough syrup that is just amazing. Just two ingredients? Can it really be that simple? YES! Find how how to make your own effective natural remedy for coughs with this easy cough syrup recipe! Seriously, this powerful combo packs a huge punch when it comes to soothing a sore throat and calming a cough. It's so easy to make, too! All you need is about a half a red onion and a bit of honey! This is a traditional folk recipe that's been passed down for generations. Yummy and boy, does this super easy cough syrup work great! How to Make Your Own Vapor Rub. **And there’s more on the blog! DRAT! You got a cough with that cold? 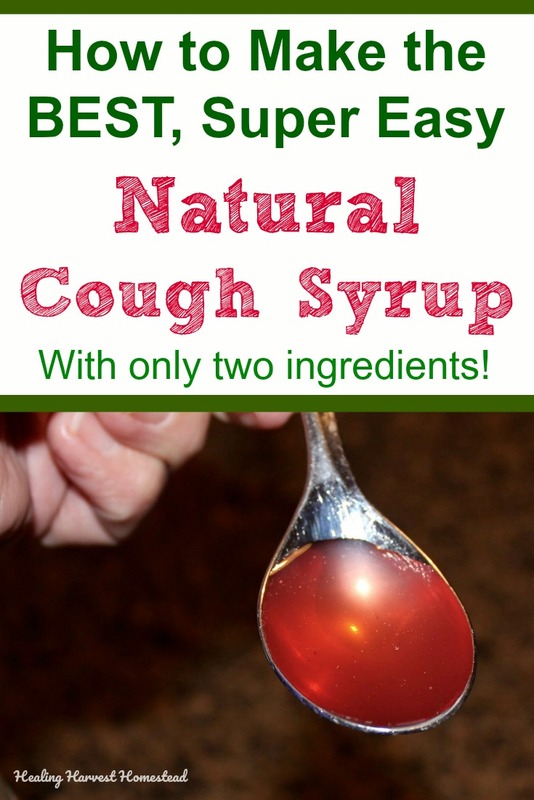 Here is a recipe for a natural cough syrup you can make easily with just two ingredients! And....IT WORKS! Find out how to make your own natural cough syrup with this recipe. This natural home remedy works for coughs FAST, and it's easy to make. Why Does This Cough Syrup Work? This Honey & Onion cough syrup has been one of my favorite cough remedies for many years. Store-bought cough syrups contain high levels of sugar and alcohol that do not do anything to help solve the problem. The chemicals they contain cause side effects. One of the reasons I love this simple cough syrup so much is not only does it soothe a cough, but the combination of the onion and honey actually helps your body get better! It also tastes really good---it's not unpleasant at all. You’re going to love this cough syrup, and it even tastes pretty good too! I know that sounds surprising, because we are dealing with onions, here. But trust me: This is some good stuff. There are two ways you can make this cough syrup: the slow way (which I think is the best), and the fast way (for when you need it NOW). Note: Raw honey should not be given to infants under the age of 12 months. **Even though this method is slower, I like it better than the fast method. You retain the nutrients from both the onion and honey because they are not affected by heat. If you need this syrup fast, you might want to make some using both methods at the same time---then you'll have ready- made syrup from the slow method set to go. Step 1. Place about an inch tall section of onion pieces into a wide mouth pint jar. I used a quart-size jar, and that's fine, but it is easier to get to the syrup with a pint-sized jar. Step 2. Now drizzle a bit of honey over the top. Like a glaze. Step 3. Now put some more onions on top. Step 4. Repeat the honey drizzle. Step 5. Keep repeating until the onions are all in the jar, and the honey is just barely covering. I tend to put WAY too much honey in mine. You just need to barely cover the onions, as they will rise to the top anyway. Step 6. Cover with a lid and let sit overnight on the counter. Step 7. After a few hours, you'll find an amazing liquid on top! It's oniony but sweet, and it is A-Mazing for soothing a sore throat and calming an irritating cough. Onions (especially red onions) are well known for their medicinal benefits and helping to cure flu and cold quickly. When combined with the honey (also a well-known antibacterial and super soothing for irritated tissues), you have a wonderful-tasting, soothing cough syrup! If you need this cough syrup right away, here is a fast stove-top option. For this option, you can add some garlic, too, if you like. The chemicals in the garlic are very powerful for boosting the immune system. It won't taste as good, but it will be very effective. Using a whole onion (or more, if you need more), slice it into thin slices and place them in a deep pan. Cover the onions with honey, just until the onions are barely covered. Now heat the mixture on LOW until the onions are soft and mushy. The honey should taste strongly of onions. NOTE: The bad thing about heating honey is it will kill any of the good organisms in it. However, if you need the syrup quickly, this is a great option! Place it in the refrigerator to keep for several days. You can strain off the liquid, but I just leave the whole mixture intact and keep getting the syrup from the top as I need it. 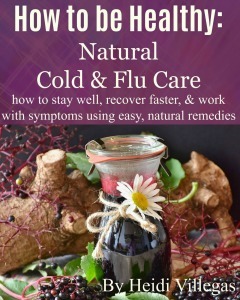 Over 35 natural ideas and remedies for cold and flu season. Ways to not get sick, what to do when you start feeling icky, how to deal with full-blown symptoms (cough, fever, congestion, headache, and more), and how to stay well when it’s over. If you want to speed up your recovery, then continue using this syrup several times a day, even after symptoms subside. You can actually keep the hot method syrup simmering away on the stove top if you like. Just be sure to keep it on slow heat and don't let the bottom burn. Otherwise, both syrups can be stored in the refrigerator for several days. I've actually used this syrup after a couple of weeks in the refrigerator, but be sure to do the sniff test first! If it tastes "off" or smells bad, do not use it. Better to be safe than sorry! This is one of my favorite home remedies ever. It's so easy to use and make, and it is absolutely better for your body than the chemical alternatives in the stores. One more thing: It's a good idea to always keep staples on hand for emergencies. Honey and red onions are two of the foods you should have in your pantry at all times. Not only might you have to create a cough syrup quickly, but they are both foods that are great for a multitude of uses. Are you interested in learning more about herbalism? I have been loving the years I've spent learning in many courses over at the Herbal Academy of New England, where the courses are taught by experienced herbalists, many with clinical experience. I hope you enjoy this, and if you give it a try, please let me know how it goes! Do you have a different way to manage coughs? Let us know! P.S. I hope you'll sign up for the newsletter if you haven't done so yet! You'll never miss a thing, and you'll get some great eBooks as gifts from me in the Resource Library!! Here are the fresh onions barely covered with honey. After sitting over night! See the liquid on top? That's the syrup! There it is! Beautiful! Onion-Honey Cough Syrup! Disclaimer: I am not a medical professional. In no manner, in any article anywhere on HealingHarvestHomestead.com or elsewhere in comments, etc. is there any implication of prevention, cure, diagnosis, or treatment of any medical issue. Please see a medical professional for advice. I simply provide my own opinion based on study and experience, and it is every person's responsibility to do their due diligence. Mar 21 How to Infuse Honey with Lemon---and Why It's Great for You!